Thinking of Becoming a Surrogate Mother? Becoming a surrogate mother can be one of the most life changing experiences you will ever take part in. In Florida in order for a couple to enter into a surrogacy agreement it must be for medical reasons. Of course with the exception of gay couples. Many couples have faced rather serious medical conditions that has pushed them to surrogacy in order to grow their families. Currently, Creative Love Egg Donor & Surrogacy Agency is assisting several wonderful couples that are ready to begin their journey to growing a family of their own with your help. Becoming a surrogate mother is not something that you should rush into without doing research on the topic. It’s important to know the facts and expectations before committing. Learn what the qualification are. Learn what the expectation are of you. Learn all of the medical commitments that are expected from you. If surrogacy has always been something you’ve wanted to enter into take a look at the requirements to see if you meet them. Surrogacy when not rushed and done correctly is a beautiful experience for everyone involved. 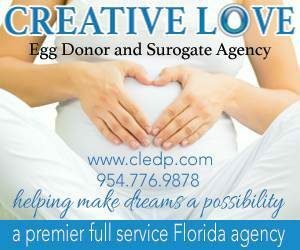 If you would like to learn more about surrogacy and the couple and individuals that Creative Love Egg Donor & Surrogacy Agency is assisting please contact us directly.